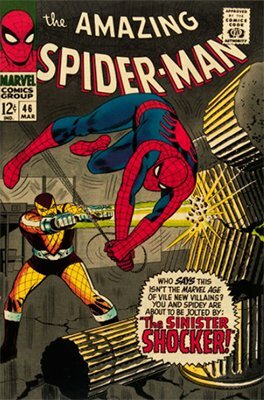 This book enjoyed a meteoric rise when The Shocker was confirmed as a bad guy in Spider-Man: Homecoming -- but his role was very minor, and disappointing. Still, it's a Silver Age first appearance in the world's most collected series. It will continue to be a popular issue. The big news is that Sony agreed to let Spider-Man "come home" to Marvel, and the resulting movie, Spider-Man: Homecoming, will feature the Shocker. This is already a minor key issue, so this additional interest has set prices on fire. It was by far the highest new entry on the 2017 100 Hot Comics list. New records are being set all the time. CAUTION: As with all movie hype bubbles, it will eventually burst. Look to make 50 percent profit, take it, and move on. Don't be caught selling pumpkins after Halloween. For some sad examples which have disappeared, see Alias #1, Preacher #1 and Shazam! 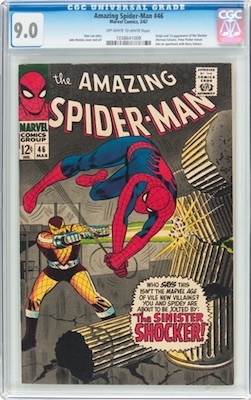 #28.